More and more people are picking up the exhilarating sport of mountain biking, taking their bikes off-road and onto unpaved territory. Mountain biking is a great way to exercise while getting outside to enjoy the sights – but it is not without risks. 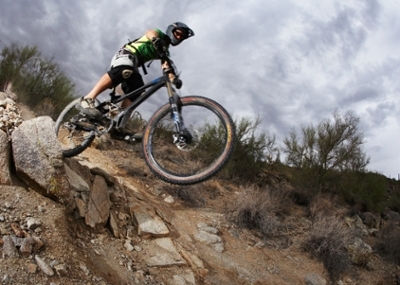 Common mountain biking injuries include bruises, scrapes, broken collar bones and wrist injuries,” says sports medicine physician Stuart Willick, MD. “More serious injuries can also occur. You also can put yourself at risk if your bike is not in good repair. Before you hit the trail check your bike for faulty parts. Inspect the entire drive chain, including the pedals, and make sure the brakes are in good working order. Inspect the tires for proper inflation and splits or cracks in the rubber, and look over the wheels for problems. It is important you are in good shape as well. Stretch before riding, and be sure you are properly hydrated and have fueled your body with a healthy meal or snack. Wear protective gear including a helmet, glasses and gloves. Don’t push your body too hard, Willick cautions.